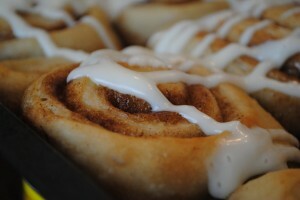 For those with a bread maker, grab your favourite bread maker buns recipe, and get ready to make fabulous cinnamon buns! Place ingredients to make your basic dough in your bread machine. Set for dough cycle. After complete on dough cycle (normally about 2 hours) remove from machine and roll out to 17×10″ rectangle on a floured surface. Next, mix together the brown sugar and cinnamon. Spread softened butter over dough and sprinkle brown sugar and cinnamon mixture over top. Roll the dough tightly length-wise, pinching edges closed when completely rolled. Slice rolled dough into 1/2″ slices and place into greased cookie sheet with a little space between them as they will expand. Let rise in a warm location until doubled in size (about 30 minutes) Bake at 350° for 15-20 minutes, until golden. Do not overbake. As soon as the buns are out of the oven, spread with cream cheese icing. Enjoy them while they’re hot! Love you website! Ever since watching you go making your 5 minute muffins on BT, I’ve been addicted to your website and all of your awesome recipes! I am going to try out this recipe this weekend, but was wondering before hand, can you omit the Butter for margerine? Does it make a big difference? I know that baking your chocolate chip cookies with PC brand low fat margerine it definitely made a difference (the kids didn’t like them at all) so I’ve stuck with regular margerine for that recipe, but was wondering if it was the same for the cinnamon buns. Can you add a “Print” button, so it condenses the page to be only your heading (so I remember where I got it!) and the recipe?? Also, I have done these (awesome!!) and topped with different flavored cake frostings, for something new for after school treats!